S. – This movie is so good it is hard to know where to begin. It hits all the right beats to keep it fun, energetic, suspenseful and engaging. The performances are very strong and, amazingly for a plot with so many characters, they are all given room to develop some complexity within the roles. Allowing the many different personalities to develop leads to a long run time, yet Kurosawa is able to balance the pacing masterfully so that the forward momentum is never lost. Most compelling is the reveal of the seven samurai, who understandably have interesting histories as esteemed warriors fallen into circumstances that have them willing to work for food. At the centre is Kambei Shimada (Takashi Shimura), the epitome of the strength, wisdom and self-control of a natural leader, who also has the disarming ability to laugh at himself and his circumstances when things get tough. His influence is felt by fellow samurai and simple villager alike, and while he mostly takes a kindly approach in his task of defending the small village from the coming threat, the moment he turns and challenges a group of men selfishly wishing to deviate from the plan is one of my favorite in the film. The affable persona is gone in an instant giving way to a fierce fighter and the mutinous villagers immediately fall back into line. Among the samurai group, which the film devotes a good hour to assemble, are also an untested youth who desperately wants to prove his worth. In many ways his story is the saddest given the decline of the vocation he was born to. The decisions faced by Katsushiro (Isao Kimura) have greater resonance in light of the fact that the future for the samurai is so uncertain. I also loved the samurai Kyuzo (Seiji Miyaguchi) who was the ultimate action hero. Tough as nails, brutally efficient, not big on small talk and with zero interest in the praise of his companions, he is the most badass guy on screen. Perhaps this type of part has become rather predictable in film now, but here it feels fresh and exciting, especially since he is not the central character. That such an accomplished warrior finds himself homeless and hungry is one of the many subtle signals of the social turmoil that was encompassing Japan. Afterall this is not a pioneer-culture that was building itself up like in the Wild West, but a devolution into very hard times. The undercurrent of the times is always present adding an urgency to the atmosphere. Focusing on the immediate threat provides some respite from deeper troubles. The foil to all the noble bearing of the hastily assembled group of warriors setting out to do a good deed is provided by the antics of faux-samurai Kikuchiyo, played with verve and vigour by Toshiro Mifune. I think I might hand this one over to you, J., before I get too carried away. You’ve already given a good rundown of the standout samurai, S., although I would add that there is basically not enough praise that one can heap on Toshiro Mifune’s performance. His wild, clownish Kikuchiyo is an absolutely frenzied performance and one of absolutely daring physicality. It should not work — at all — but he sells it with such conviction, giving real heart and soul to a buffoonish thug. So with the samurai done, I want to note the performances of the villagers. I’m tempted to go through the principal village characters one by one, so strong are their performances (particularly those of Tsuchiya Toshio as the determined but heartbroken Rikichi and Fujiwara Kamatari as the fearful Manzo), but I think it is almost better to think of them as a collective. The villagers in this film are basically a swirling id — a vortex of emotional instability that seems to always be at the extremes. They fall into deadly despair, roil up in vengeful bloodlust, and laugh like hyenas. It is a fantastic group performance that manages to insert energy and intensity into every frame of the film, even when all the swords are safely sheathed. This is a long film, but even the most mundane scenes are played at a fever pitch, which is a tough place to sustain for over three hours, but Kurosawa’s quick cutting and restless camera only intensify the volatility. The villagers make for a very entertaining collective that seem to flock about like starlings driven by raw emotion. In this scene the whole village squats in the main square to bemoan their fate, while Rikichi (left, played wonderfully by Tsuchiya Yoshio) absolutely seethes with anger and the seeds of defiance. S. – The heightened drama of the acting is not normally a style I warm to, here I think it works for a couple of reasons. The first one, as you mentioned, J., is the creation of the villagers as an entity. Aside from the individual motivations of a few select players we see the ensemble as a desperate group stuck between a rock and a hard place. Instead of painting them as “salt of the earth” types that are beyond reproach and the innocent victims of unsavory characters, we see the villagers are also self-serving, dishonest and capable of brutality that rivals that of the bandit foes. On more than one occasion a thoughtful pause by Kambei conveys the ethics that the samurai are bound by are not shared by the people they have agreed to defend. Which begs the question just what are the samurai risking their lives to protect? An ideal of the integrity of making an honest living off the land is quickly shattered by the shameless wavering of village group between simpering compliance and rebellion. The other effect of the flamboyant emotions of the villagers is in creating tension. The samurai are all so contained and focussed that the frequently changing mood of the locals keeps the energy up during what is essentially a waiting game as we watch the barley grow. An interesting intersection of the hysterical villager and the controlled warriors is thrown up in Kikuchiyo, while he has the bravery and fearlessness of a samurai his hyper-emotional demeanour instantly mark him as a farm boy. Though the samurai in this film are themselves down on their luck, they are generally afforded a certain dignity in the way they are filmed that is not granted to the villagers. It is a nice, subtle way to highlight the differences between the classes — differences that are independent of wealth. J. – I think that tension at play between the villagers and the samurai is what really elevates this film into the all-time classic realm. There are plenty of great action films or epics, but few have the moral ambiguity and insight into the complexities of human nature that Seven Samurai consistently displays. The villagers are essentially horrible, but as Kikuchiyo rightly points out, much of their conniving and duplicity is the result of having to defend themselves from the warrior class — be they bandits or samurai. It is great too that the film dares to suggest that our heroes and their upright ethics aren’t all they appear to be. Indeed, the film introduces us to a number of samurai in the first hour who are cowards and/or assholes, and some of the seven aren’t really all that competent. These prominent flecks of impurity allow the movie to raise the characters above being basic archetypes and create a surprising amount of nuance and humanity amongst the hysteria of the situation and the stylized performances. In this regard, Seven Samurai is a supremely confident film; one that always knows exactly what it wants to be at every moment — no mean feat for a film that explores many tones, characters, subplots and action set pieces. 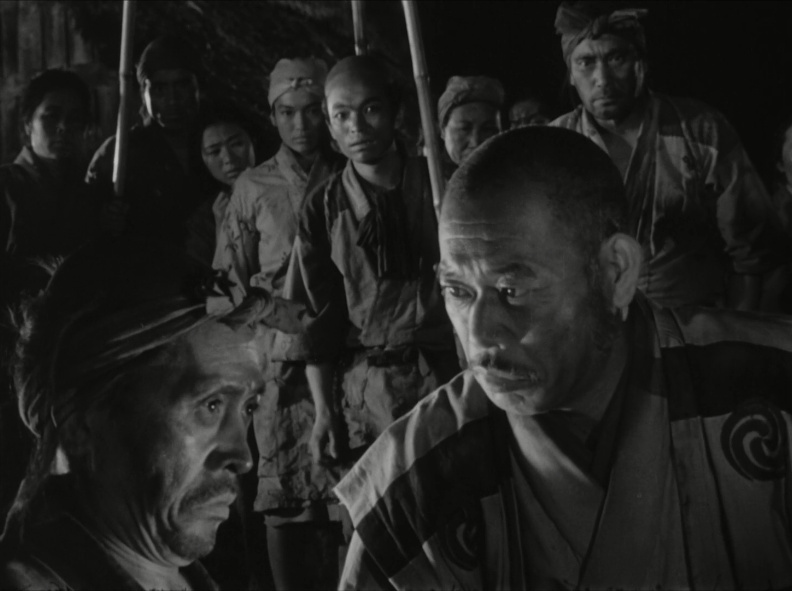 I think we need to get back to these thematic elements at the close of this yammer, S., because the ending of the film is a powerful one that really pulls the many threads of the film together into a compelling statement, but I’d like to move onto the actual look and feel of Seven Samurai. 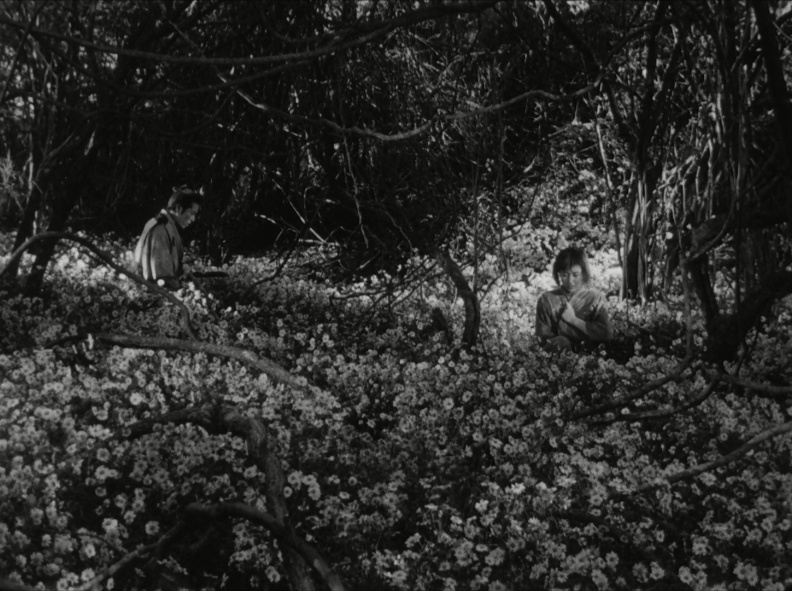 Kurosawa is a visually compelling filmmaker, but I’m not sure I’d be willing to say he has a particular aesthetic. There is nothing here that screams “Kurosawa!” in the way that Ozu’s tatami mat shots or Welles’ deep-focus chiaroscuro instantly bring those filmmakers to mind. In this regard he reminds me a bit of Jean Renoir, in that he enjoys long takes and a pivoting camera but doesn’t necessarily create a consistent visual vibe. But he’s far more daring than Renoir in his action directing and there is constant movement in this film. Be it the characters or the camera, nobody sits still for long. 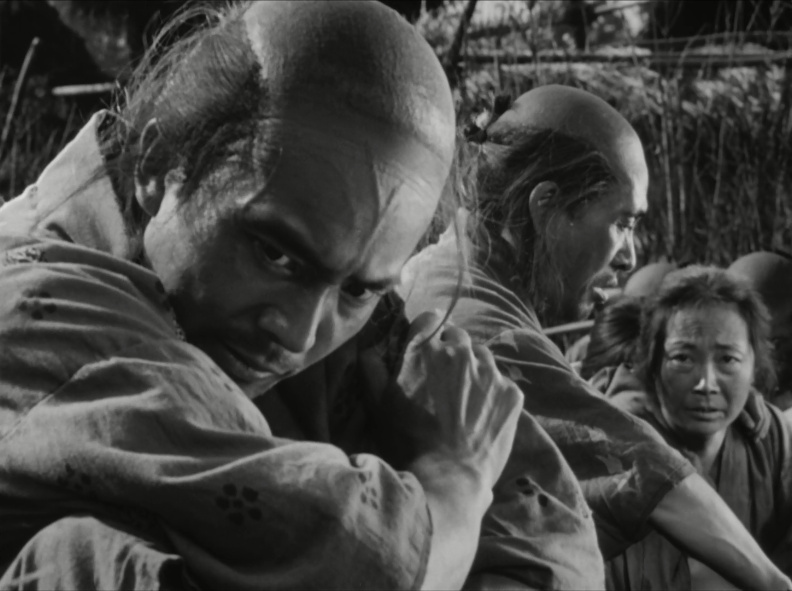 The film does an excellent job of maintaining the rift between the villagers and the samurai, even as the two parties come together to face off with the bandits. Fujiwara Katamari (left) is particularly good in the role of Manzo, a farmer with a supreme mistrust of the samurai. S. – The camera movement tends to be dynamic, pulling the viewer into the fray. There is the sensation of being in amongst the action whether that is lolling around with surly men in a boarding house, bobbing about with a pack of frantic villagers or running headlong into the thick of battle. Somehow the distance between viewer and onscreen action is reduced to almost nothing by the sweeping camera movements. The environment also becomes a part of the story, there is a deliberate care in establishing the layout of the village (which is put to good use in the awesome battle planning scene) and just as the villagers display qualities both attractive and ugly the scenery varies from flowering fields to bleak mud pits. The most striking image for me is the stark windblown hillside that becomes the graveyard for those lost in battle, which visually echoes the seven samurai’s banner. The world is constructed with care and Kurosawa leads you through it with such freedom and confidence, that you feel a sense of ownership. Quite an amazing feat, and one that considerably raises the stakes as the bandits finally begin to close in. The action choreography is wonderfully chaotic and energetic in the film, but that is pushed to the limit by the camerawork, which frequently throws the audience right into the midst of the action and by getting in tight accentuates the speed and fury of the fight. You’d be hard pressed to find an earlier film that is so dynamic — and shockingly modern — in its action. J. – The action filming is exceedingly dynamic and often does throw you right into the fray as the bandits attack the village. 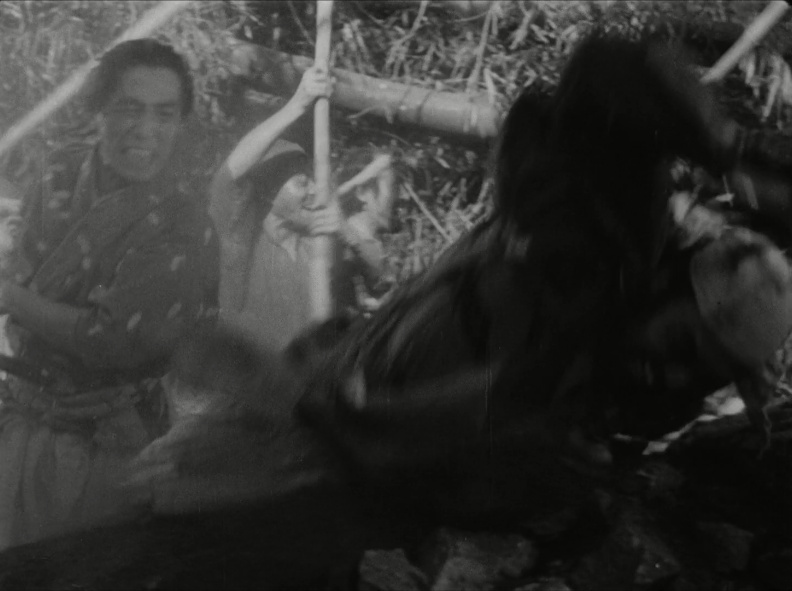 Kurosawa makes great use of the chaos of battle, not just through the whipping cameras and movement of the performers, but also by frequently shooting scenes in environments that feature obstructions. Be it through windows or between the legs of horses, the action is often broken up by obstructions placed between the camera and the players, which gives something of a flickering to the already chaotic scene by having everything pop in-out, in-out of the audience’s field of vision. But like you hinted at, S., the chaos never becomes overwhelming or disorienting because the filmmaker takes so much time to establish the geography of the village. This is very deliberately done as the villagers and samurai prepare their defense of the village, a series of scenes that serve the three-fold purpose of developing the characters, ratcheting up the tension for the eventual bandit attack, and making the audience intimately familiar with the layout of the village. When the fight kicks off in earnest this preparation pays off big time, with assaults and fights breaking out all around the village but in a way that is comprehensible to the viewer. This kind of ground work is all too rarely done in films these days (or it is inelegantly done through tedious exposition or bogus wire-frame holograms), and can lead to confusing and ultimately pointless displays of violence. I think particularly to the battle that opens up the overblown, over-rated mess that is Gladiator. There’s plenty of cool images in that fight but it is utterly incoherent, and consequently more of a senseless maelstrom than a compelling narrative of life and death. 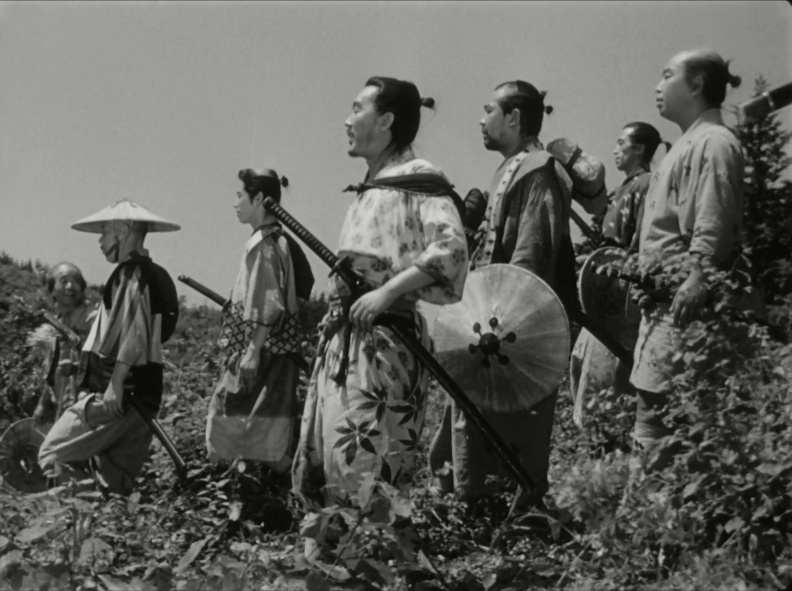 And Seven Samurai is absolutely a compelling narrative of life and death, giving equal focus to both elements. This is a story of sacrifice and violence, but also one of growth and perseverance. In the end the bandits are defeated and the village is safe, but Kambei declares that the samurai have lost. And he is not wrong in this. It is the villagers who have won, and I think that is laid out best in the abruptly truncated love story of young samurai Katsushiro and farmer’s daughter Shino. In a Hollywood film these two would end up together — no question. But even though Seven Samurai is essentially an epic take on the Hollywood Western, it is very much a Japanese film and as is the case in many Japanese films and stories, the guy doesn’t get the girl. Indeed, their relationship doesn’t bring the classes together so much as highlight the extent to which they are apart. And while she may be forcing it some, it is Shino singing in the fields at film’s end while Katsushiro can do nothing but walk away in silence. The unconventional love story between Katsushiro and Shino is an excellent opportunity to showcase the separation between the samurai and the villagers, but it is also the subplot that probably has the most lovely cinematography in the film, as their meetings often take place in beautiful or unconventional settings like a wood full of chrysanthemums. S. – Part of what is so satisfying about watching the foreign-language films on the list is that the movie tropes you have grown up with suddenly have no traction. Sometimes things go the way you think they will, other times they don’t even come close. As a viewer you are watching without a safety net. The final showdown, when it does arrive is utterly engrossing. There are no tricks, the samurai aren’t superheroes just men skilled in the ways of battle and they coach the villagers through the fraught and frightening encounter. It is telling that the samurai who do not survive the bandit’s raid are all brought down by guns, the new technology superseding the age of hand-to-hand combat. There are certainly heavy losses but the ultimate victory feels hard earned and satisfying because of them. Most moving of all is the bittersweet ending, some might find it a little heavy handed but the radiant joy of the villagers seems almost callous as the greatly reduced party of heroes drift off again into the unknown as they are no longer needed. Seven Samurai is an epic movie that I look forward to watching again and again. J. – Goodness knows I have watched it again and again. For this yammer we had the good fortune to see Seven Samurai on the big screen, which was such an amazing treat. I was telling people about it at work the next day as part of the standard Monday morning “So what did you do over the weekend?” chat, and nobody had even heard of it. That’s all but criminal. We’ve spoken a lot in this yammer about class divides and some of the formal aspects of Kurosawa’s moving camera and other such matters, and I fear that we haven’t quite gotten across how much fun this film is. Let me put it this way, this movie features a guy sticking a whole bunch of swords in the ground ahead of a battle because he “can’t kill a lot with just one sword”. It’s that kind of awesome — go see it.